Technetium99m-ethylenedicysteine (99m Tc-EC) was first introduced as a potential renal tubular imaging agent alternative to technetium-99 m mercapto-acetyl-triglycine (99m Tc-MAG3). The hepatobiliary excretion of 99m Tc-EC is very low and usually does not affect image interpretation on routine imaging. However, the possibility of visualization of the gallbladder, which might mimic an ectopic kidney, should be kept in mind while reporting the 99m Tc-EC renogram study. Here, we present an interesting case of a 4-year-old child suspected for ectopic right kidney in whom 99m Tc-EC renogram study was performed, and the scan revealed abnormal visualization of gallbladder simulating as an ectopic kidney. A 4-year-old male child presented with left loin pain and fever. On ultrasound abdomen, the right kidney was not visualized, and right ureterocele was present. 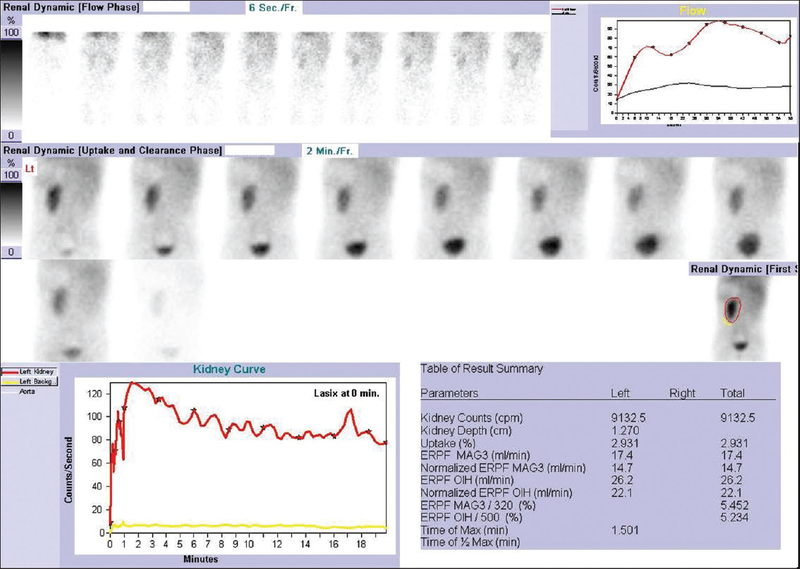 The patient was referred for 99m Tc-EC renogram for localization of ectopic kidney, function, and subsequent drainage of kidneys. 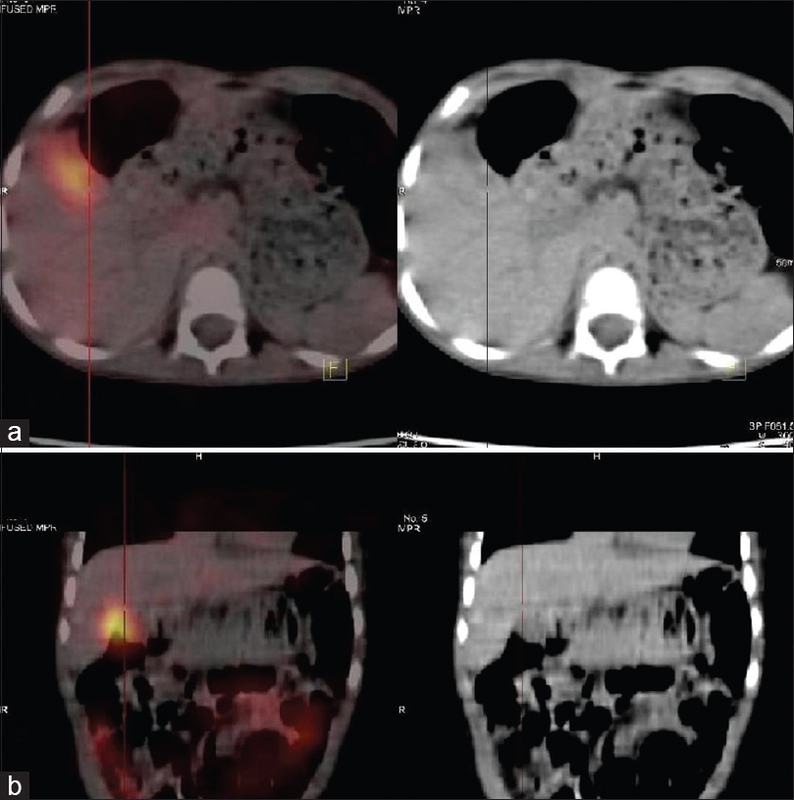 After intravenous administration of 1.4 mCi 99m Tc-EC with 10 mg furosemide, the patient was placed in supine position, and dynamic images were acquired using Symbia E dual head Gamma camera (Siemens). Renogram study showed that the left kidney was normal in size and shape and located slightly inferior to normal position. Perfusion and initial dynamic images showed mildly reduced radiotracer uptake in renal parenchyma, with normal intrarenal transit time. Drainage into collecting system and subsequent clearance were appropriate, with increase in counts during delayed images and showing double peak which was suspicious for vesicoureteric reflux. The right kidney was not visualized in the right renal fossa [Figure 1]. Delayed static images were acquired for 60 s on 128 × 128 matrix at 2 and 4 h postinjection [Figure 2]. There was focally increased tracer concentration in the right hypochondrium in delayed 2 h image and another focus of increased radiotracer concentration just below it. In view of suspected ectopic kidney, abnormal radiotracer localization in the right hypochondrium was initially thought as ectopic kidney and to confirm it a single-photon emission computed tomography (SPECT) CT scan was done. 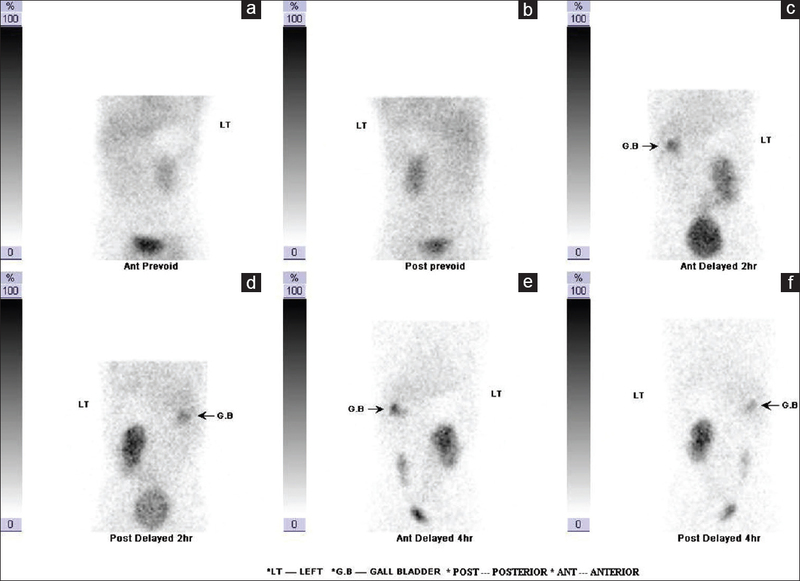 The abnormal foci of increased radiotracer uptake in the right hypochondrium corresponded to gallbladder and bowel on axial fused SPECT CT images [Figure 3]. With the aid of SPECT CT images, we were able to confirm the two abnormal foci of radiotracer concentration as gallbladder and bowel rather than ectopic kidney. 99m Tc-EC has efficient extraction fraction and excretion through the kidneys and is closer to 99m Tc-MAG3 in function., It provides high-quality images due to negligible liver accumulation and high kidney to background ratio., Different authors had shown significantly low accumulation of 99m Tc-EC in the liver and intestine than that of 99m Tc-MAG3 in animals as well as in humans. The lower liver activity makes 99m Tc-EC particularly attractive in patients with renal failure. The presence of different stereoisomers of 99m Tc-EC in different kits may result in different excretion characteristics of EC. However, the visualization of gallbladder with non-hepatobiliary radiopharmaceuticals was also reported in many studies, and it was not always pathological. Previous authors had documented hepatobiliary excretion of 99m Tc-EC as a region of normal biodistribution of the tracer., Another cause for altered biodistribution of a radiopharmaceutical was thought to be as a result of its low radiochemical purity., Gallbladder visualization in the present study cannot be attributed to the quality of 99m Tc-EC because gallbladder activity was not seen in any other patient injected with the same preparation of 99m Tc-EC on the same day. Arora et al. reported a case of dual cadaveric renal transplant, who underwent an EC renogram and showed incidental uptake in gallbladder on delayed images, confirmed on SPECT/CT images. Jain et al. reported a case with liver uptake on EC renogram. The initial perfusion images showed liver activity in the right abdominal region, which was thought to be due to high blood flow to the liver, but persistence of activity in the delayed image raised the suspicion for normally located impaired functioning enlarged right kidney. SPECT CT images acquired had confirmed the radiotracer localization in liver. The possibility of visualization of the gallbladder should be kept in mind while reporting the 99m Tc-EC renogram. It might masquerade an ectopic kidney; hence, such cases need to be interpreted with caution. Arora G, Damle NA, Tripathi M, Bal C, Kumar P. Vicarious visualization of gall bladder on tc-99m ethylene dicysteine renal dynamic study. Indian J Nucl Med 2012;27:257-8. Jain TK, Phulsunga RK, Gupta N, Sood A, Bhattacharya A, Mittal BR. Vicarious liver visualization in solitary functioning kidney with technetium-99m ethylenedicysteine renal scintigraphy. Indian J Nucl Med 2015;30:272-4. Verbruggen AM, Nosco DL, Van Nerom CG, Bormans GM, Adriaens PJ, De Roo MJ. Technetium-99m-L, L-ethylenedicysteine: A renal imaging agent. I. Labeling and evaluation in animals. J Nucl Med 1992;33:551-7. Kabasakal L. Technetium-99m ethylene dicysteine: A new renal tubular function agent. Eur J Nucl Med 2000;27:351-7. Vallabhajosula S, Killeen RP, Osborne JR. Altered biodistribution of radiopharmaceuticals: Role of radiochemical/pharmaceutical purity, physiological, and pharmacologic factors. Semin Nucl Med 2010;40:220-41.